Now 62-years-old with six grandchildren, Houssein has supported the Eve Branson Foundation (EBF) for many years at the Berber Boutique. He started out as a local artisan making metal and glass lanterns, lighting and objets d’art and his son Redouane now continues his trade. You will see much of his work at Kasbah Tamadot including the impressive lighting in the reception area and library. 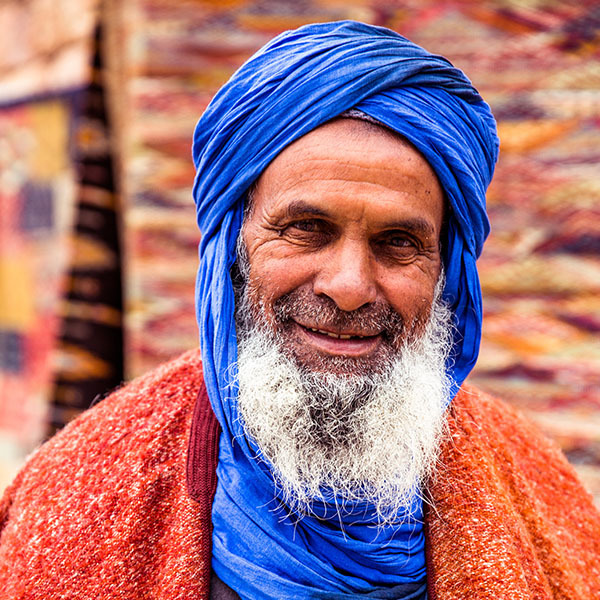 He created the Berber Boutique space on the road to sell typical Moroccan items such as rugs, vintage jewellery and shiny brass lamps that can be found in the souks of Marrakech. Over time, the boutique became a treasure trove of gifts where passers-by could browse and enjoy haggling with Houssein. When Eve comes, she is always excited to visit the Berber Boutique and check out what’s new. The Berber Boutique today contributes 35% of its sales to help with the running of EBF with 5% going towards the Big Tidy litter collection programme.